Capstick on DVD is available only as a "6-pack" of all his video titles. Three hundred seventy minutes of African Hunting Adventures. A Sportsmen on Film DVD production. Capstick on DVD is available only as a "6-pack" of all his video titles. 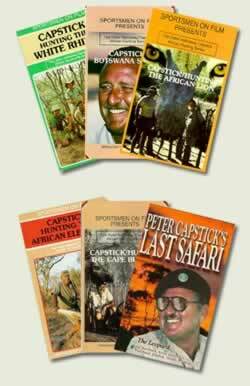 Peter Capstick's Last Safari, Capstick Botswana Safari, Capstick Hunting the African Lion, Capstick Hunting the Cape Buffalo, Capstick Hunting the White Rhino, andCapstick Hunting the African Elephant. Three hundred seventy minutes of African Hunting Adventures.